Survey says educators view ed tech as a motivational tool. I can count on both hands — and probably even a few toes — the number of surveys I’ve encountered in recent months that attempt to capture how students, and often their parents, feel about the use of technology in schools. Almost across the board, students and parents say they want more access to mobile applications and personalized instruction. Of course, there’s another group of stakeholders who factor prominently into this equation: teachers. All of the smartphones and notebooks and tablets in the world mean very little unless teachers are prepared to use them effectively in class. So, what do teachers want? 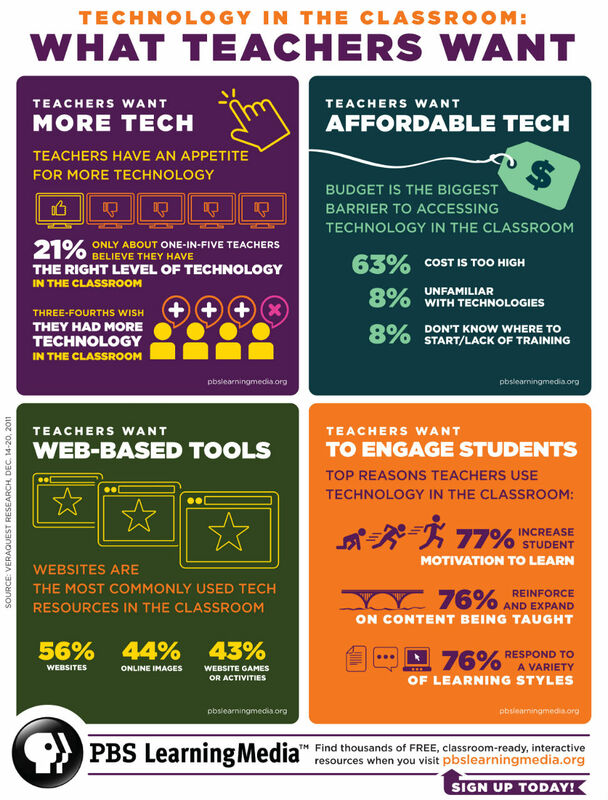 According to this PBS Learning Media infographic, which we first encountered on the online news site Mashable, teachers are just as eager, if not more, than students to embrace technology as a tool for learning. Three-quarters of teachers who responded to a recent PBS poll said they want access to more technology in the classroom; 56 percent said they use websites as a tool to help students learn; and 77 percent said they use technology to motivate students. Just 21 percent of respondents said they have the right level of technology in their classrooms. Want to learn more about how your colleagues rank the importance of technology in their classrooms? Check out the infographic below.